60% Good multitasking performance and lots of features for a very good price. A dual-core notebook for less than $900? Acer delivers just that with the AMD Turion 64 X2-powered Aspire 5102WLMi, which boasts strong multitasking performance along with all the features you could want in a 15.4-inch notebook. Style mavens may not appreciate the 5102WLMi’s rather utilitarian silver design; it’s all business here, folks. Once the lid is popped, you’re treated to a smooth, silver-and-black interior with glossy highlights. The 5102WLMi’s non-glossy, 15.4-inch WXGA display is fine for watching DVDs. Colors were crisp and vibrant, and we didn’t see any heavy glare or reflections. The 14.1 x 10.6 x 1.2-inch body features a wide, comfortable keyboard that makes typing a leisurely endeavor. The actual keys, however, exhibited a bit too much flex. Beneath the keyboard is a spacious touchpad. 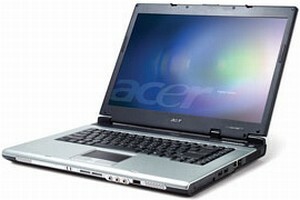 The Acer Aspire 5102 WLMi is a notebook that will satisfy general users. While the Aspire 5102 lacks some of the features found in other Aspire notebooks, most notably the Aspire 5672, it is still an extremely good buy. With a dual core processor, 1 GB RAM and 120 GB hard drive for under $900, it is a better deal than even many Dell notebooks. It is quiet, offers plenty of power for the average user, and provides decent entertainment. It is a perfect notebook for the college student and mainstream home user who doesn't require extensive calculations or demanding games.